Green concrete is a revolutionary topic in the history of concrete industry. This was first invented in Denmark in the year 1998. Green concrete has nothing to do with colour. It is a concept of thinking environment into concrete considering every aspect from raw materials manufacture over mixture design to structural design, construction, and service life. Green concrete is very often also cheap to produce, because, for example, waste products are used as a partial substitute for cement, charges for the disposal of waste are avoided, energy consumption in production is lower, and durability is greater. Green concrete is a type of concrete which resembles the conventional concrete but the production or usage of such concrete requires minimum amount of energy and causes least harm to the environment. The CO2 emission related to concrete production, inclusive of cement production, is between 0.1 and 0.2 t per tonne of produced concrete. However, since the total amount of concrete produced is so vast the absolute figures for the environmental impact are quite significant, due to the large amounts of cement and concrete produced. Since concrete is the second most consumed entity after water it accounts for around 5% of the world‘s total CO2 emission (Ernst Worrell, 2001). The solution to this environmental problem is not to substitute concrete for other materials but to reduce the environmental impact of concrete and cement. Pravin Kumar et al, 2003, used quarry rock dust along with fly ash and micro silica and reported satisfactory properties. The potential environmental benefit to society of being able to build with green concrete is huge. It is realistic to assume that technology can be developed, which can halve the CO2 emission related to concrete production. With the large consumption of concrete this will potentially reduce the world‘s total CO2 emission by 1.5-2%. Concrete can also be the solution to environmental problems other than those related to CO2 emission. It may be possible to use residual products from other industries in the concrete production while still maintaining a high concrete quality. During the last few decades society has become aware of the deposit problems connected with residual products, and demands, restrictions and taxes have been imposed. And as it is known that several residual products have properties suited for concrete production, there is a large potential in investigating the possible use of these for concrete production. Well-known residual products such as silica fume and fly ash may be mentioned. The concrete industry realised at an early stage that it is a good idea to be in front with regard to documenting the actual environmental aspects and working on improving the environment, rather than being forced to deal with environmental aspects due to demands from authorities, customers and economic effects such as imposed taxes. Furthermore, some companies in concrete industry have recognised that reductions in production costs often go hand in hand with reductions in environmental impacts. Thus, environmental aspects are not only interesting from an ideological point of view, but also from an economic aspect.  Reduction of CO2 emissions by 21 %. This is in accordance with the Kyoto Protocol of 1997.  Increase the use of inorganic residual products from industries other than the concrete industry by approx. 20%.  Reduce the use of fossil fuels by increasing the use of waste derived fuels in the cement industry.  The recycling capacity of the green concrete must not be less compared to existing concrete types.  The production and the use of green concrete must not deteriorate the working environment. 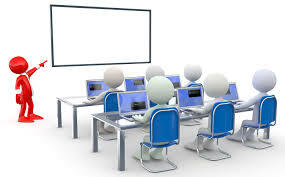  The structures do not impose much harm to the environment during their service life. Green concrete has manifold advantages over the conventional concrete. Since it uses the recycled aggregates and materials, it reduces the extra load in landfills and mitigates the wastage of aggregates. Thus, the net CO2 emissions are reduced. The reuse of materials also contributes intensively to economy. Since the waste materials like aggregates from a nearby area and fly ash from a nearby power plant are not much expensive and also transport costs are minimal. Green concrete can be considered elemental to sustainable development since it is eco-friendly itself. Green concrete is being widely used in green building practices. It also helps the green buildings achieve LEED and Golden Globe certifications. 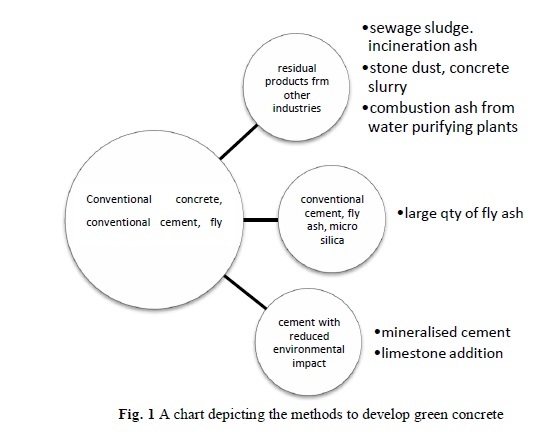 Use of fly ash in the concrete also increases its workability and many other properties like durability to an appreciable extent. One of the practices to manufacture green concrete involves reduction of amount cement in the mix, this practice helps in reducing the consumption of cement overall. The use waste materials also solve the problem of disposing the excessive amount industrial wastes. b) Low production costs as wastes directly substitute the cement. c) Saves energy, emissions and waste water. d) Helps in recycling industry wastes. e) Reduces the consumption of cement overall. h) Greater strength and durability than normal concrete. i) Compressive strength and Flexural behaviour is fairly equal to that of the conventional concrete. j) Green concrete might solve some of the societies‘ problems with the use of inorganic, residual products which should otherwise be deposited. One of the major disadvantage of conventional concrete is the high self weight of the concrete. Density of the normal concrete is in the order of 2200 to 2600 kg/m3. This heavy self weight will make it to some extent an uneconomical structural material. Attempts have been made in the past to reduce the self weight of the concrete to increase the efficiency of the concrete as a structural material. Using light weight aggregates, the density of the concrete decreases to 300 to 1850 kg/m3. The use of lightweight concrete provides structural efficiency and economic advantages. Well documented performance over a period of decades has demonstrated that lightweight concrete can be used reliably in most concrete applications. There are many advantages of having low density. It helps in reduction of the dead load, increases the progress of the building, and lowers haulage and handling costs. The weight of the building on the foundation is an important factor in design, particularly in the case of weak soil and tall structures. In framed structures, the beams and columns have to carry the loads of floors and walls. If floor and walls are made of light weight aggregates it will result in considerable economy. Another most important characteristic of light weight aggregate is the relatively low thermal conductivity; a property which improves with decreasing density in extreme climatic conditions. The use of light weight aggregates with low thermal conductivity will be of considerate advantage from the point of view of thermal comforts and lower power consumption. It gives an outlet for industrial wastes such as clinker, fly ash, slag, etc. which otherwise create problem for disposal. Light weight aggragates can be classified into two categories i.e. Natural light weight aggregates are not found in many places and they are also not of uniform quality. As such they are not used very widely in making light weight concrete. Out of natural light weight aggregates, Pumice is the only one which is used rather widely. Different light weight aggregates have different densities. Naturally when this aggregate is used, concrete of different densities are obtained. The strength of the light weight concrete depends on the density of concrete. Less porous aggregate which is heavier in weight produces strong concrete particularly with higher cement concrete. The grading of the aggregate, the water/ cement ratio, the degree of compaction also effect the strength of concrete. Most of the light weight aggregate with the exception of bloated clay and sintered fly ash are angular in shape and rough in texture. They produce a harsh mix. Particular care should be taken to improve the workability with the addition of excess of fine material, pozzolanic material or some other plasticizing admixtures, The strength of the aggregates will also be influence by the type of fine aggregates. For increasing the strength, for improving the workability and for reducing the water requirement, sometimes natural sand is used instead of crushed sand made of light weight aggregate. Use of air-entrainment will gratly improve the workability, and the tendency for bleeding in the light-weight concrete. But the use of air-entrainment will result in further reduction in strength also. The structural light weight concrete is going to be one of the important materials of construction. A concrete which is light in weight and sufficiently strong to be used in conjunction with steel reinforcement will be a material which is economical than the conventionsl concrete. Therefore, a concrete which combines strength and lightness will the unquestionable economic advantage. Structural Light Weight Aggregate Concrete is a concrete having 28 day compressive cement strength more than 17 MPa and 28 day air dried unit weight not exceeding 1850 kg/m3.The concrete may consists entirely of light weight aggregate or a combination of light weight aggregate and normal weight aggregates. Concrete; a primary building material is extremely energy intensive to make and transport, and produces a significant amount of the world’s greenhouse gas emissions. Concrete’s impact on the environment starts when limestone is blasted in quarries to make cement – the binder, or substance that sets and hardens it into a useful building material. Cement accounts for 7 to 15% of concrete’s total mass by weight and is made by superheating (in coal-fired kilns) a mixture of limestone and clay and then grinding the resulting substance into a powder. When this power mixes with water, it forms strong calcium-silicate-hydrate bonds that can bind other particulates, like sand or gravel, to make concrete. The cement-to-water ratio determines the strength of the concrete. Once limestone has been blasted and mined it is then transported to a cement plant, where the fuels used by the plant and machinery produce CO2 emissions. Next the limestone, or calcium carbonate, releases CO2 when it is heated to make the cement. Forty percent of CO2 emissions from the cement plant come from the combustion process and Sixty Percent of CO2 emissions come from the calcination process. Since calcination is intrinsic to the process, they must focus on reducing energy use associated with the manufacture of concrete. Concrete producers also say that as concrete ages, it carbonates and reabsorbs all the CO2 released during calcination – but this process takes hundreds of years. The general consensus is that cement manufacturing produces about 5% of global CO2 emissions generated by human activity, and 3% of global emissions of all greenhouse gases. By comparison the transport sector is responsible for about 15% of global greenhouse gas emissions, so concrete has a pretty hefty share of the pie considering it’s just one material.To overcome all these effects, green cement is produced. This cement is based on an intermediate product, clinker, which is produced with minor additions of mineralizes to the kiln..These mineralizes are Calcium Sulphate (CaSO4) and Calcium Fluoride (CaF2).With the addition of these mineralizes, the energy consumptions are reduced by 5%. Also the CO2 emissions get reduced. It is found that there is a 5-10% increase in 28-day strength of the cement.